A major corporation has developed technology that’s able to ferry people through space in a state of hibernation until they reach a new planet called Homestead 2. By the time they arrive at a place that’s free of Earth’s deterioration and crowding, they’ll have been in a state of suspended animation for 120 years. One hundred and twenty years of watching people sleep isn’t exactly a promising movie possibility, so as we watch the new sci-fi romance, Passengers, we quickly learn that one of the ship’s 5,000 passengers, a mechanic played by Chris Pratt, has awakened up from hibernation. Of course, there’s catch. 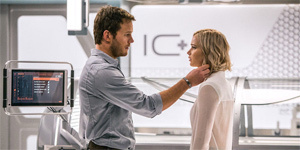 Pratt’s Jim discovers that a malfunction has brought him back to life. The rest of the crew and the passengers are still hibernating. To make matters worse, Jim has been jarred awake some 90 years before the ship is scheduled to arrive at its destination. He’s doomed to spend the rest of his life alone while traveling to a destination he’ll never reach. Cue the panic. Cue the loneliness. Cue Pratt growing an unruly beard to show us that time is passing, and that Jim is losing his grip. Jim tries to think his way out of his problem, but can’t. Instead, he avails himself of some of the spaceship’s amenities: a basketball court, a very cool swimming pool with a transparent bubble at its end, and a well-stocked bar tended by a witty and perpetually pleasant android named Arthur (Michael Sheen). All of this has the makings of a dark space opera with existential overtones, but unfortunately the movie has other things in mind, namely romance and jeopardy. After spending a year going crazy, Jim decides to take matters into his own hands. He’ll wake up one of the other passengers, a beautiful woman whose background he learns from the ship’s records. Enter Jennifer Lawrence as a journalist whose major ambition was to find a great story. Romance arises and... well... I won’t say too much more about what happens. Let’s just note that the on-and-off romance between Jim and his newly awakened companion feels more contrived than emotionally grounded. Director Morton Tyldum (The Imitation Game) has some major toys at his disposal — aside form Lawrence and Pratt. The movie’s spacecraft (Avalon by name) is full of long corridors leading to a grand concourse where the 5,000 passengers are supposed to mingle once they’ve been awakened from their space slumbers. The great awakening is supposed to happen four months before landing. Watching Pratt and Lawrence adjusting to the fact that they’re alone in space creates some interest, even if questions arise about how such a sophisticated vessel could have no backup for what might be its most important function: sustained hibernation. OK, so credibility doesn’t much matter during moments such as the ones in which Lawrence puts on her bathing suit and goes for a swim in Avalon’s amazing pool or when Pratt dresses like a janitor and uses his mechanical skills to build things or when one or the other of them engages Arthur in banter. Of course, at some point, Lawrence’s Aurora will learn that she didn’t wake up by accident, but was condemned to live and die on this ship by the man she’s falling for. Then what? All I’ll say is that the movie doesn’t condemn us to 89 years of hostility, but contrives to find ways to put the entire mission in jeopardy as it stumbles its way toward a conclusion. Perhaps because they could think of no place else to go, screenwriter Jon Spaihts (Dr. Strange, Prometheus) and his cohorts introduce another character, a ship’s officer played by Laurence Fishburne. His hibernation chamber malfunctioned, too, which means even bigger problems loom. A laughable finale doesn’t help to give this foundering space voyage the lift that it needed, and the movie delivers its message — enjoy what you have rather than looking forward to where you’re going — with no more eloquence than you’d expect if such a statement were to fall out of fortune cookie. Passengers doesn’t stint on eye candy (both human and technical), but its enjoyable moments suggest that somewhere in the Avalon’s 120-year journey, a smarter script might have found time to play with some of the bigger questions inherent in the movie’s premise. But like Jim and Aurora, Passengers is stranded in a world full of cooked up plot points and, at key times, a lack of gravity. One-hundred and twenty years of space flight presents a challenge for any writer, but this crew would have done well to pack some heavier thematic baggage for the ride.